The battle can best be described by breaking down the battlefield into three sectors. The Souther Sector, where the Austrians were engaged, the Northern Sector, the Prussian zone, and the Centre where Russian forces were deployed. With the Austrians nearest the French in the southern area of the battlefield it was likely that the initial battle was going to occur in this sector. Indeed, action was soon joined when elements of the Austrian advance guard pressed forward around 8.30am. Below, Austrian Hussars can be seen deployed protecting Austrian horse artillery, both having advanced down the road. 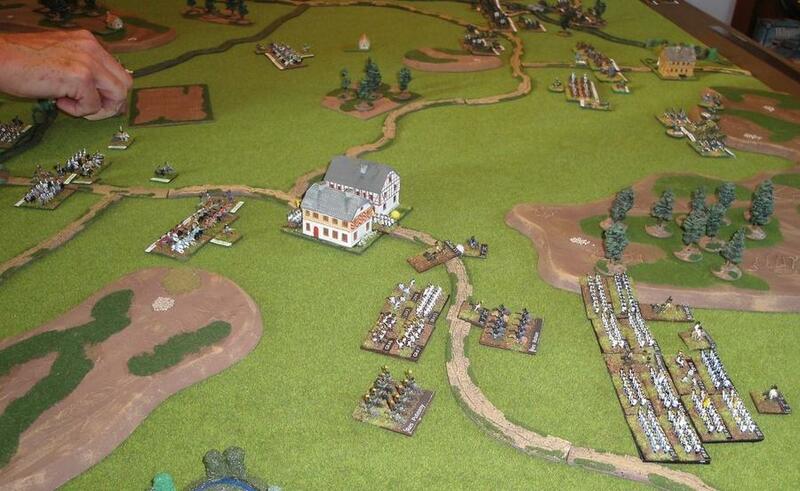 Deployed some 400 yards from elements of Ney’s wing, the French right flank, the Austrian artillery opened fire. The French in turn countered and soon after 9am French infantry and artillery were across the stream and poured a devastating fire into the Austrian cavalry who were forced back having suffered heavy casualties. 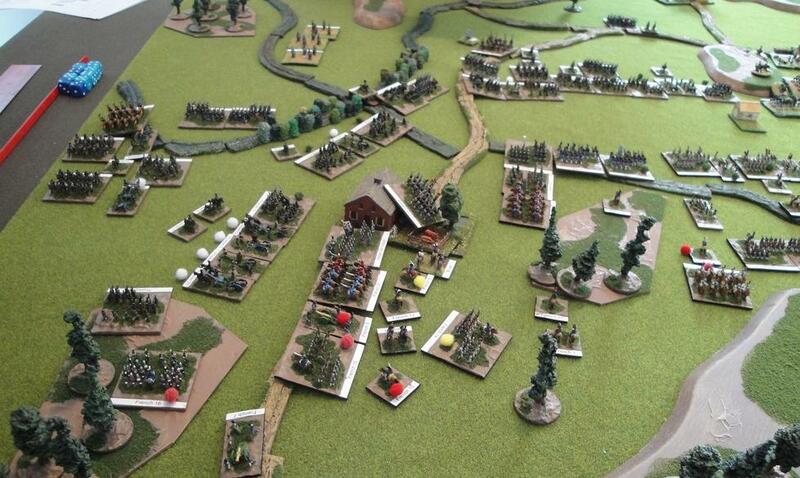 Despite the Austrians reinforcing the attack the Austrian advance guard was driven back and Ney pressed forward. Elsewhere Austrian forces also advanced and around 8.30am advanced elements of Austiran infantry secured the town of Hennersdorf. Hennersdorf would come under to determined attacks but the Austrian garrison was never seriously threatened. Hennersdorf, seen below just after the initial occupation marked the forward position of the Austrian line. The scale of the battle can be illustrated by a more general photograph taken around noon which can be seen below. The situation is viewed from the south with the Austrians in the right foreground and Ney’s command, forming the French right flank on the left. 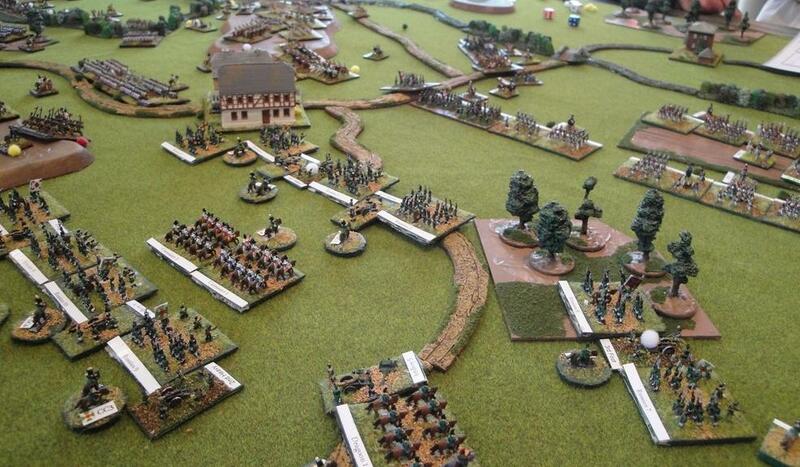 Ney’s forces have pressed forward to the eastern branch of the Bieber Stream. The small town of Apfeldorf can be seen on the extreme right and sits astride the Austrian line of communication. Now a significant long range bombardment occurred with French and Austrian artillery exchanging fire for several hours. Ney juggled his forces here for several hours removing some divisions from the line and moving in fresh formations. He was finally to launch a concentrated attack late in the day. Unfortunately for Ney this final attack was unsuccessful, unlike the Austrian counter-attack at 8pm which regained much of the Austrian positions which had slowly been lost during the afternoon. On the Allied right flank, the north of the battlefield, the forces were also advancing. Around 8am the Prussian advance guard was well deployed. At this point the Prussian advance guard could see French cavalry far to the south, but nothing to oppose them to the front. Murat was yet to arrive. The Prussians advanced rapidly as possible, but were hampered somewhat by streams and the inability to initiate complex manoeuvres due to the landwehr units that contributed to manpower of each Prussian division. When Murat’s troops began to arrive on the field, just after 8am, many were strung out along one road in march column, and would therefore take time to concentrate. Murat ordered the town of Bellingheim be occupied by a converged Baden brigade from Marchand’s 39th Division. While seemingly a strong position it had the fatal flaw of allowing a very limited frontage to deploy north of the Bellingheim. Below, the situation around 10am with Murat’s troops now well forward. Prussian trops can be seen in the top right. 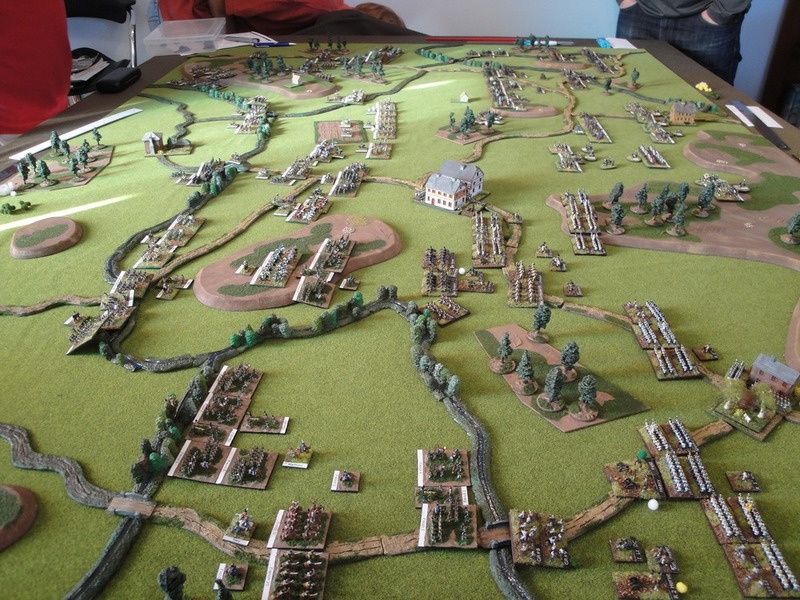 This exposed French position was quickly exploited by the Prussians who had superior artillery numbers and were able to pound the narrow French frontage. As the French artillery and infantry became disordered and casualties mounted they were replaced as more and more men were fed into the ‘meat grinder’. 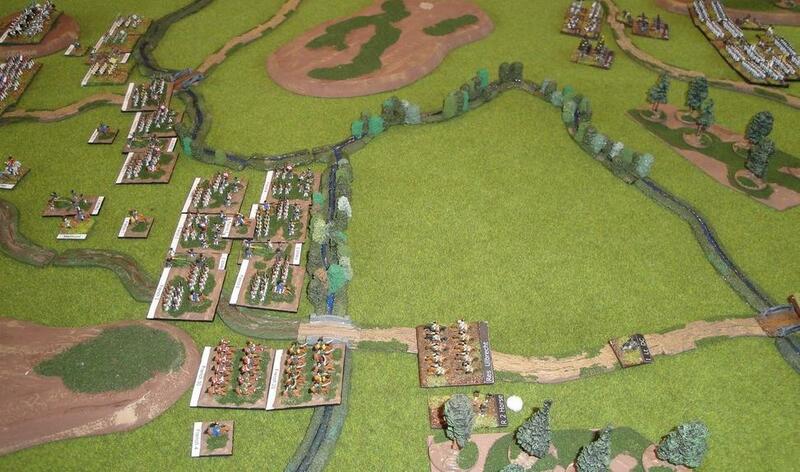 At this point Blucher seized the initiative and launched a cavalry charge against some disordered infantry. When the dust settled the infantry had been completely dispersed, but only a few troopers survived to return to our lines – Blucher was not among those to return. Prussian sources indicate Blucher was found after the battle alive and well at the head of a contingent of prisoners from Hesse-Darmstadt who he had single-handedly persuaded to desert. Above, the Allied right flank viewed from the Prussian lines with Murat’s forces opposite. After four or so hours of pounding the French lines began to collapse and sacrificial cavalry changes were launched while the surviving infantry retreated. After these charges were fought off it was noted that the French cavalry was now reluctant to charge, and Prussian cavalry supported by horse artillery harried them to the south-west, in the process cutting Murat’s line of communication. At this point Russian cossacks appeared on the scene to offer their support. It is believed that Murat himself participated in one of the many desperate charges and was severely wounded. Above, the French left flank is turned 90 degrees and attempts to hold Bellingheim and Murat’s own line of communication. By this stage it appeared that many of the French commands were beginning to collapse, and Bellingheim was stormed by regulars from von-Thumens 4th Brigade supported by reserve infantry. The Landwehr watched on bravely. Further attacks were launched and as darkness fell columns of dispirited French survivors could be seen streaming to the south-west. Meanwhile in the centre French troops also advanced. 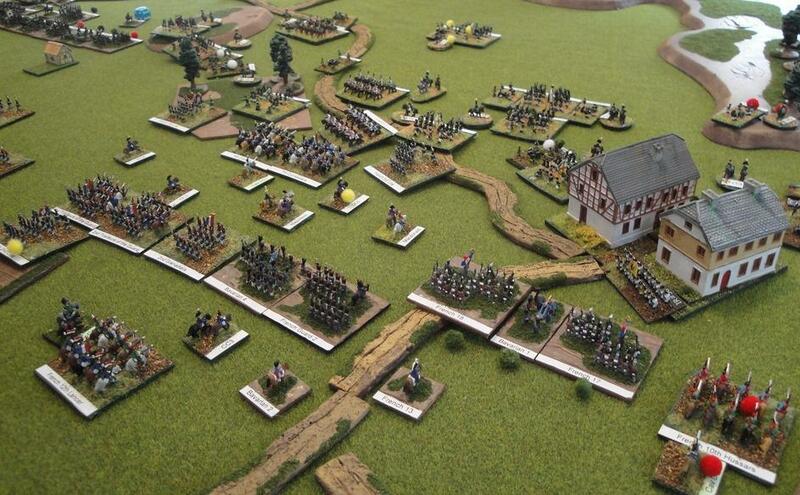 Initially Napoleon seemed hesitant to deploy his infantry across the Bieber Stream. As a result the plain to the east of the Bieber towards Hennersdorf was initally covered by two cavalry divisions. However, by 10am the French centre was across and in the coming hours would be reinforced further by two guard divisions. 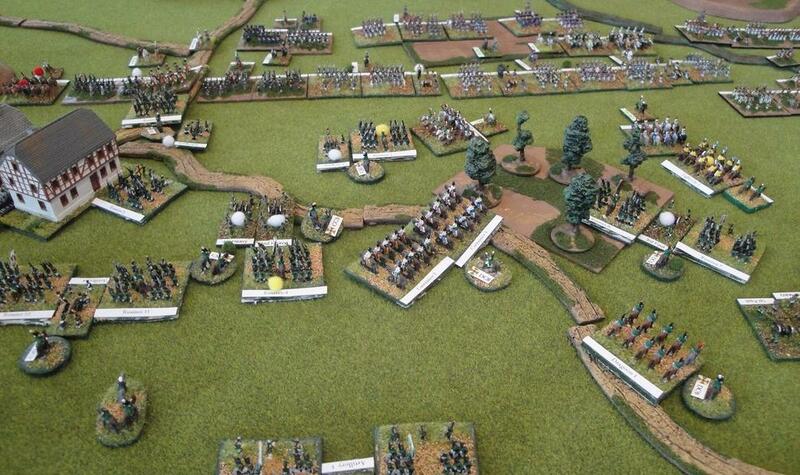 Below, and viewed from the French lines, French infantry and cavalry can be seen advancing in the foreground. A division of Young Guard and another of Old Guard can be seen crossing the Hennersdorf in the right centre around 10am. Prussian formations can be seen on the top left and withdrawn somewhat are elements of three weak Russian Corps to the left of Hennersdorf. For his part Barclay de Tolly focussed his troops on holding the centre where he hoped his preponderance of artillery would be espcially useful deployed supporting the outnumbered Russian infantry. To this end the main Russian position extended north of Hennersdorf to a large wood before extending further again until linking with Blucher’s Prussians. Below, the situation around 11 am viewed from the Russian right rear with Hennersdorf on the top centre. From 11am thourgh the afternoon the battle in the centre became very fluid. Napoleon sought every advanntage while de Tolly likewise strove to both hold his position and reinforce the line. Below Russian cavalry on the right prepare to charge some of Murat’s over extended heavy cavalry while in the centre a disordered Russian Brigade, deployed too far forward is itself charged by French cavalry. As noted previously Hennersdorf formed the right flank of the Austrian sector. 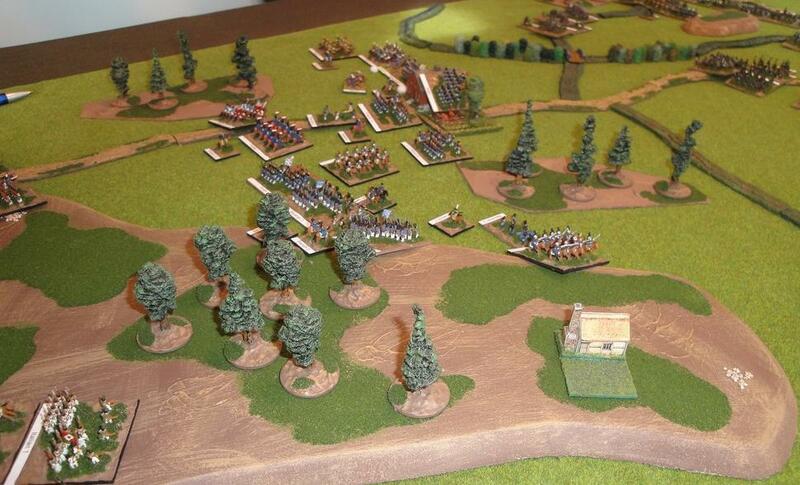 Garrisoned by a converged brigade, comprising Infantry Regiments 17, it would be subjected to two assualts. Below, elements of French 13th Division can be seen deployed opposite Hennersdorf while Bavarian artillery bombard the town at close range late in the afternoon. Limited and largely ineffective fire was return by dedicated guns supporting the Hennersdorf garrison. To the left of Hennersdorf French and Russian cavalry can be seen engaged. 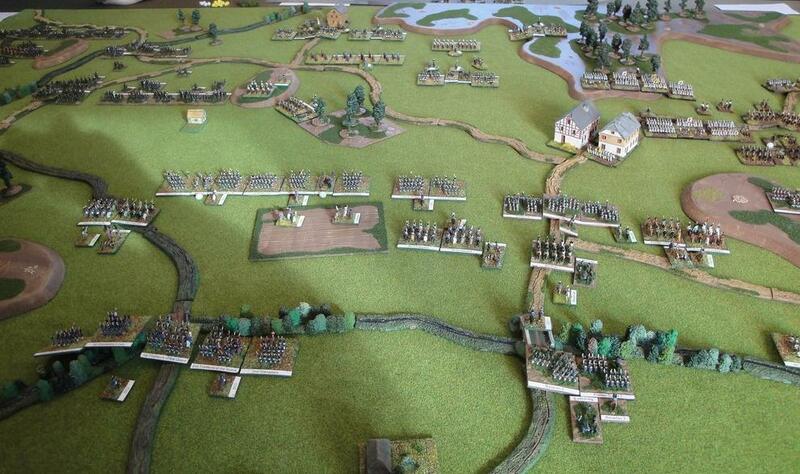 By the end of the day five Russian Divisions would be exhausted and two more near exhaustion. The Russian divisions, all short of manpower had fought with great determination and held the centre. The final outcome however was clear. Napleon’s left had been smashed by the Prussians. 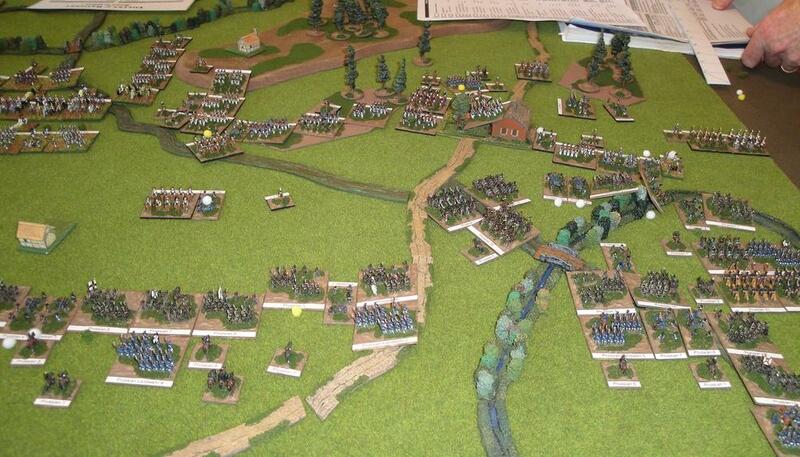 This resulted in the loss of two of his three lines of communication and many troops. His centre had failed to break the Russians and now faced envelopement from Prussian cavalry and Russian Cossacks. His right, where Ney had been expected to achieve victory was exhausted and held by the Austrians. Napoleon had no choice but to order a retreat. The battle of Hennersdorf was a clear Allied victory. Part III of the report can be found here.